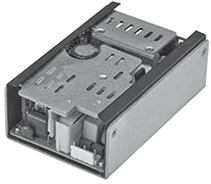 The PSEP1200U series of open frame power supplies offers up to 200 watts of output power in a 5″ x 3.21″ x 1.77″ package. This series has a wide input voltage range of 90~264VAC and single, dual, triple, and quad outputs are available. The PSEP1200U series has high minimum efficiency of 85%, is RoHS compliant, and has over voltage, over current, and short circuit protection. It has UL/CUL, CB, CE, and FCC safety approvals and has been 100% burn-in and hi-pot tested. Please call factory for details. (2) Efficiency depends on models.